hiking, rafting, fishing, sightseeing, and festivals. fishing– many streams are stocked with trout including Spring Creek which is a mile fromWilderness Lodge. 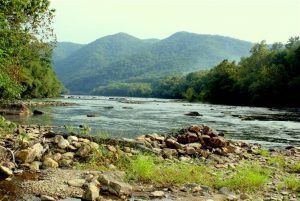 Other fishing options are the French Broad River, and Laurel River near Hot Springs. sightseeing– the mountains are scenic, and rich with history. Just driving and stopping at various scenic spots can be an enjoyable day. 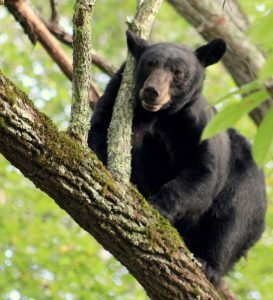 You might even see a bear like the one shown below that was across from my home! Largest privately owned home in the U.S.
of naturally heated spring water would be soothing, or maybe a massage! Clay shooting in Spring Creek. Fun for the experienced or novice shooter.